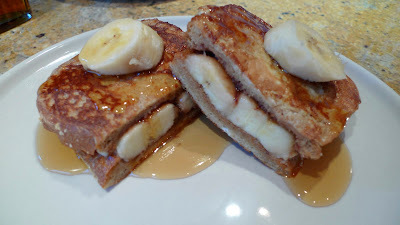 I was rummaging through my fridge and cupboard trying to come up with something to make for breakfast one weekend and vaguely remembered an episode on the Food Network for Peanut Butter and Banana Stuffed French Toast from Cafe 222 in San Diego. When I lived in San Diego, we would walk by Cafe 222 all the time but I never ate there before. 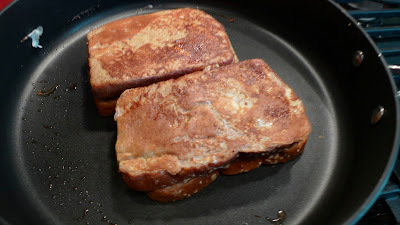 Apparently Bobby Flay loves their french toast so I thought I'd give it a shot. 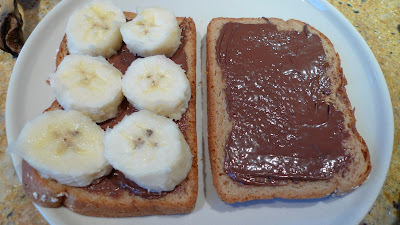 I happened to have some Nutella in the cupboard so I was curious how Nutella would go with Peanut Butter and Bananas. 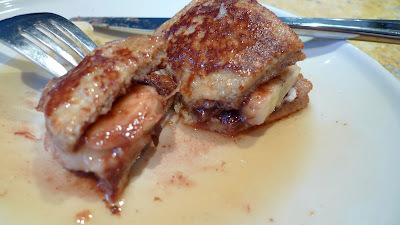 I ended up doing a sampling of all three flavor combinations and made three different types of french toast: one with just Nutella and bananas, another one with peanut butter and bananas and the last one with all three. Here's the recipe that I adapted from Cafe 222. 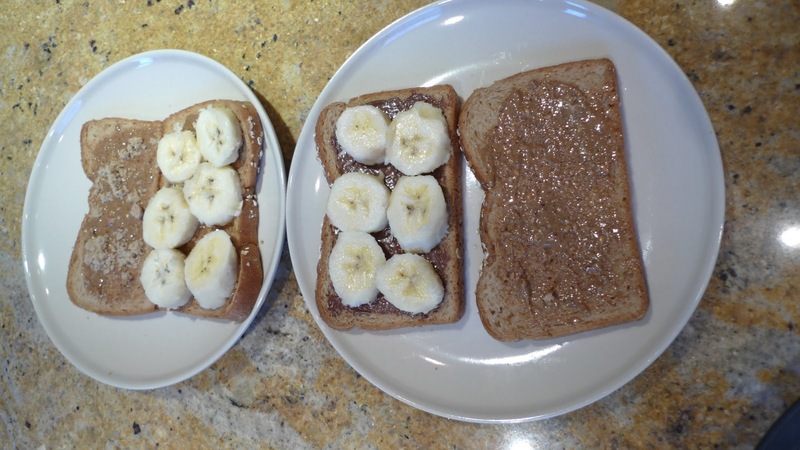 Lay bread out on counter and spread a thin layer of peanut butter or Nutella on each slice. 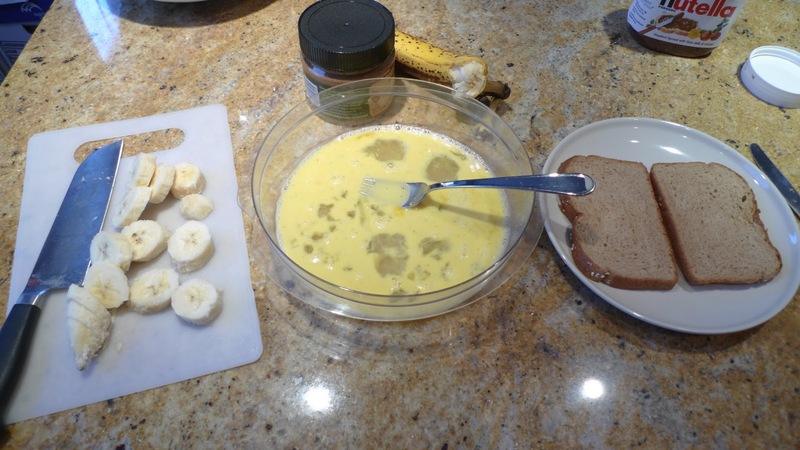 Peel banana and slice enough to cover every other piece of bread. (You will be making 3 complete sandwiches). Drizzle a small amount of honey or brown sugar on each piece of bread that does not have banana on it. (These are the tops). 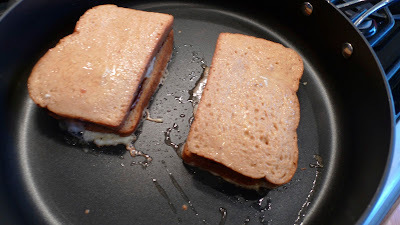 I didn't put brown sugar on the Nutella sandwiches because they are already pretty sweet, but for the peanut butter one I did. It's totally up to you. Put the slice of bread on top of the piece with bananas on it to make a sandwich. Repeat until you have made 3 sandwiches. 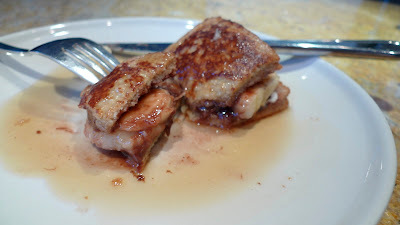 The Nutella and banana one is on top. The peanut better and banana is to the left and the Nutella, peanut butter and banana sandwich is on the right. In a shallow medium sized bowl, gently whip, by hand, the eggs, milk, vanilla, cinnamon, nutmeg and salt. Heat skillet to medium heat or until the butter melts and begins to sizzle. Dip 1 sandwich at a time into the egg batter and place into skillet. Cook until golden brown (about 3 to 4 minutes before turning) on each side. Remove from skillet and cut in half. Top with butter, any remaining banana pieces and maple syrup. I asked Susan which flavor combination she preferred and not surprisingly she said she didn't even realize that they were different. lol. To her credit, I probably wouldn't have noticed either if no one told me, but the differences were quite subtle. I personally like the Nutella, peanut butter and banana combo. It was the perfect amount of nuttiness, sweetness and chocolate all rolled into one. If you have all the ingredients in your kitchen, I say go for it! This definitely put that extra bounce in my step that morning. I hope it does the same for you too!